Hi there, my friend guitarist without guitar picks with holes yet. You and I have a passion in common. Don’t you feel a hero when playing your best shot? I do. I feel like nothing can take my guitar and I apart. Why don’t I create guitar picks with holes that would best fit my guitar? In 2014, I decided to invest in the production, adding new materials, more quality and more products for sales. EigenPlectrum® has worked side by side with their first customers to make sure they deliver the best quality guitar picks with holes on the market. Today, EigenPlectrum® is selling guitar picks with holes to the entire world. Design your very own guitar picks with holes. How to order your guitar picks with holes? Your order is placed and you will receive a confirmation email within a few minutes. You will also be notified when the shipping is ready to leave the Netherlands and you will be provided with a tracking number, to make sure you know when your guitar picks with holes arrive. But there is more. EigenPlectrum® offers free shipping for order of € 50 or more. When will I received my guitar picks with holes? We then pass the box on to PostNL and provide you with a tracking number. 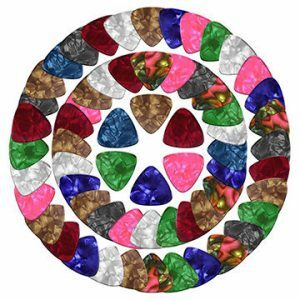 Depending on your location, you will be receiving your custom guitar picks within the shortest time available. How many guitar picks with holes can I get? Again, we do not only sell guitar picks with holes. Want more out of your guitar picks with holes? Then, pick your product and upload the design you have created: you have just made your very first guitar picks with holes. Why choosing guitar picks with holes? All of us guitarists – we share a talent, a passion, an experience. But all of a sudden, here we go again. That bloody standard pick just broke, one more time. That is why, since I started using my guitar picks with holes, I have never had the same problem again. EigenPlectrum® guitar picks with holes are made with the best materials on the market. Looking to promote the next concert of your band? Guitar picks with holes are a great and affordable way to advertise the event: they are even cheaper than printed flyers! Want to gift your fellow musicians in the band? Create a set of guitar picks with holes, maybe with the band logo and your friends’ names. Your best friend is a guitarist and you are out of gift ideas? Buy them a guitar picks custom card: it will be an unexpected but appreciated surprise! There are a million reasons why you should order your guitar picks with holes now: you name them!